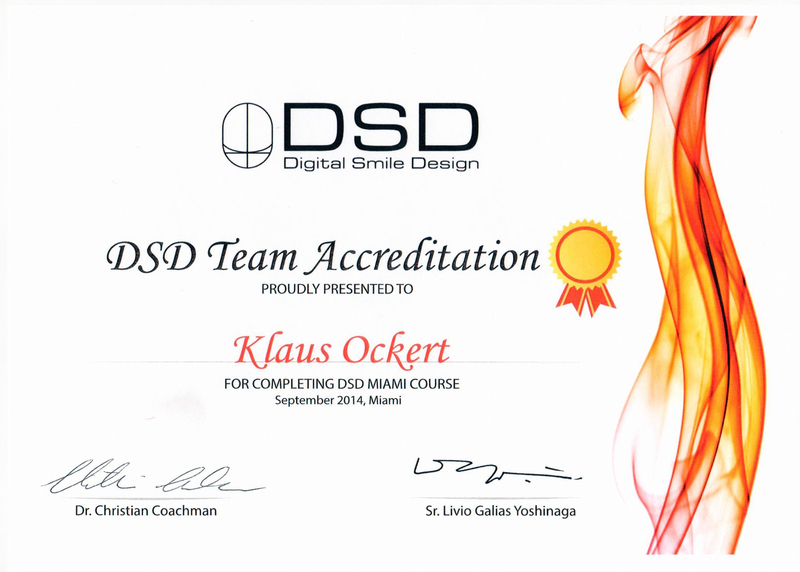 Klaus Ockert attended the September 2014 Digital Smile Design (DSD) Super Week USA in Miami for four consecutive days (the first Super Week held in the USA!). He was accredited with course completion, as shown in the certificate above, by flawlessly navigating his way through all of the learning objectives and modules taught during the week-long seminar. 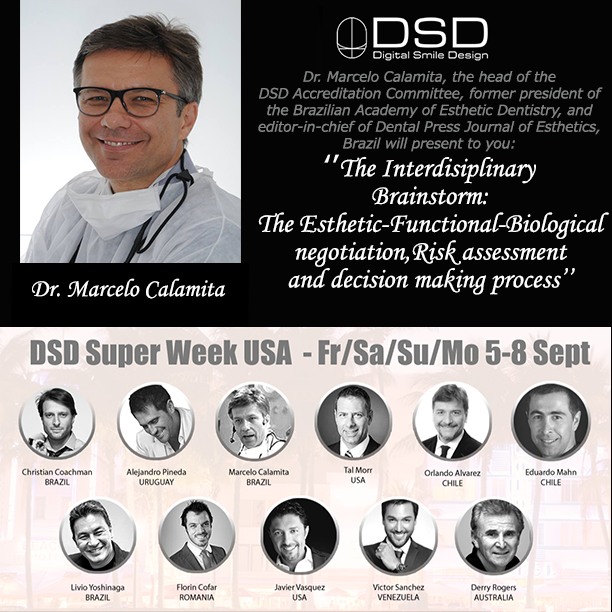 DSD’s Super Week USA is targeted to all dental professionals looking to influence their patients’ satisfaction, including Dental Technicians, Dental Assistants, Oral Surgeons, Periodontists, Endodontists, Cosmetic Aesthetic Dentists, and General Dentists. The week was spent utilizing, learning, and improving use of the Digital Smile Design concept—a multipurpose protocol which provides remarkable advantages in diagnostic abilities by facilitating them through an extra-and-intra oral aesthetic and structural evaluation, improving the communication between team members, providing a better visual perception, education, and motivation for patients, and increasing effectiveness of case presentation and, accordingly, case acceptance. The DSD concept ethically involves the patients in the restorative or smile enhancement process, making them the ‘co-designer’ of their own treatment by sharing objectives, expressing their desires and expectations with the restorative team. The week was filled with information and training on how the DSD concept can seamlessly merge into most existed 3-D Orthodontics software. The simplicity of this protocol revolves around the fact that it does not require any special equipment, software or major financial investment. Klaus’ attendance allowed him to watch demonstrations of the DSD concept performed on live patients in a fully-immersive environment. He was also able to meet and get close to the brilliant minds behind the concept and active professionals Christian Coachman, Livio Yoshinga, Javiar Vasquez, and Marcelo Calamita and had a Miami-filled blast during the social events held by DSD.